Fact Check: How's Trump's Proposed Border Wall Coming Along? 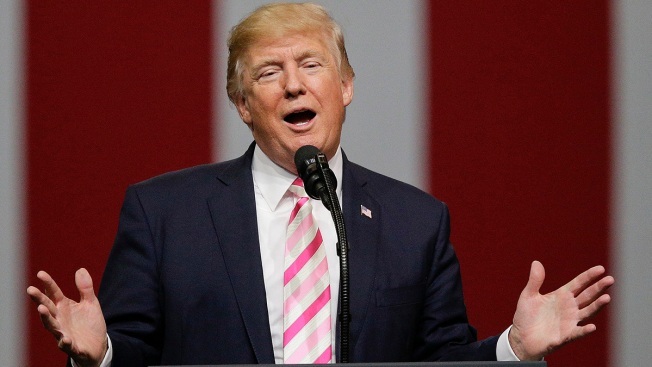 In this Sept. 22, 2017, photo, President Donald Trump speaks at a campaign rally in Huntsville, Ala.
President Donald Trump's latest account of progress on his promised Mexico border wall was often misleading and sometimes flat wrong. Parts were true, but parts were not. He contradicted himself, and the overall sense he conveyed of construction steaming along simply doesn't fit the facts. TRUMP: "So you need to have a great wall, but it has to be see-through. We are now looking at samples. We have four samples that have already been built, General, right? They've been built. And we're looking at different samples already of see-through walls. And I think also I have to be honest with you, a see-through wall would look better. You know, you don't have that, whatever it might be. But we are looking at four different samples built by four great companies, four different concepts. They're just about completed." THE FACTS: Yes, the government is looking at samples. No, they have not "been built." Nor are they "just about completed." Construction of the prototypes has yet to begin. That's expected imminently. The government awarded contracts for eight prototypes. "Has to be" see-through? Not necessarily. Four of the chosen prototypes are concrete; the rest are made of "other materials." Trump's reference to the general was about John Kelly, his chief of staff and retired Marine general, who joined him at the rally. TRUMP: "We're soon going to have the final choices done. And the renovations will be done, I would say, within the next six or seven months. We're spending a tremendous amount of money and we're going to have that." THE FACTS: It's not clear what he means by renovations. His administration has not outlined sweeping renovations to be done in that time. Its request to Congress for $1.6 billion in wall financing for the budget year that begins Oct. 1 includes money for 14 miles of replacement barrier in San Diego and it's not certain Congress will approve even that. Money has been approved for three miles of border protection in Calexico, California. Such projects do not add up to the massive construction that would be required to fulfill his promise of a wall sealing off the two countries along the length of their border. TRUMP: "We're going to build the wall, it's coming along great." THE FACTS: To date, not much is coming along beside the samples, repairs and some upgrading of what's already in place. TRUMP: "We've been dealing with ICE, we've been dealing with the Border Patrol. They both endorsed me, first time they've ever endorsed a candidate for president." THE FACTS: Neither the Border Patrol nor Immigration and Customs Enforcement endorsed Trump for president. They are government agencies and can't endorse anyone politically. Two unions representing border and immigration agents who work for those agencies endorsed him. Spagat reported from San Diego. Associated Press writers Luis Alonso and Jill Colvin contributed to this report.